Liberation Day is Guam’s biggest holiday and is celebrated annually on July 21st. Commemorating the day Guam was liberated from Japanese forces on July 21, 1944, Liberation Day is a day the island honors the 1,170 Chamorros who were killed during the occupation, and the 14,721 who endured atrocities of the war. Liberation Day celebrates the war survivors who are with us today, as well as the brave servicemen who fought and won the battle for Guam. Liberation Day is marked every year with a grand parade down Marine Corps Drive in the island’s capital village of Hagåtña, and the celebration continues into the evening with the Liberation carnival and fireworks. 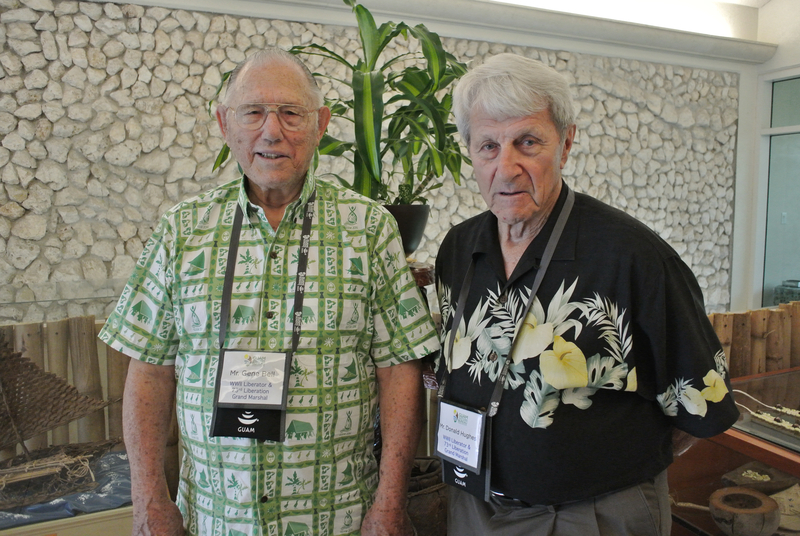 This year’s Liberation Day parade will be led by two grand marshals who were instrumental in the battle for Guam: World War II veterans Gene Bell and Donald Hughes. 91-year-old Gene Bell was just 17 years old when he landed on Guam in 1944 as a corporal in the 3rd Marine Division, the first replacement unit to arrive after the invasion. "We were the replacements that came in after the 3rd Marine Division made the initial landing. We were there to replace the other marines who died,” Bell said. During his time on Guam, Bell’s unit did patrols every day in remote areas of Guam, searching for the estimated 5,000 enemy troops believed to be hiding in the jungles. He vividly recalls the devastation he witnessed on Guam in 1944. “People didn&apos;t have real clothes. The island was completely devastated. It was unbelievable, there was absolutely nothing left.” Bell said. Since those harrowing months in 1944, Bell has returned to Guam 19 times and has a deep love for the island. "I love this island and I love the people here – that&apos;s why I&apos;ve been back 19 times," Bell said. World War II veteran Donald Hughes was also just 17 years old when the war brought him to Guam as a Seaman First Class aboard the USS Maguffin, a troop transport ship whose mission was to transport troops in support of the mission to recapture islands from Japanese forces. Hughes piloted a landing craft vehicle and courageously drove into enemy fire to transport Marines in the Battle for Okinawa. “I have always been proud of the service I gave to my country. But being here today, and realizing what a difference we were able to make here on Guam and throughout the South Pacific, I am reminded of how important it was that we did our job well,” Hughes said. This visit is Hughes’ first trip to Guam since the end of World War II. The 73rd Liberation Parade starts at 9:00am on July 21st and is expected to end at 2:00pm. The Liberation carnival, located next to the Chamorro Village in Hagåtña, will open at 2:00pm following the parade. The Liberation Day fireworks display will begin at 9:00pm. The Liberation carnival is open Wednesday through Sunday from 6:00pm to 10:00pm through August 13.